During our various trips to Singapore we’ve seen Aftershock machines many times. They’re usually used to showcase new technology at launch events, we saw a couple at the last Nvidia event and they always stand out with slick looks and features they don’t skimp on. 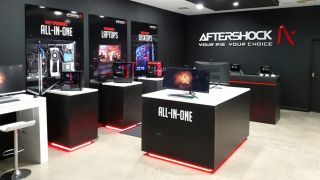 Aftershock has been steadily expanding its territory since its launch in Singapore six years ago. As you can see from its Australian site, the Aftershock systems aren’t plain. We’ve only ever seen the laptops in the flesh and they’re slick-lookers with a well-rounded set of features. The desktop and AIO builds do look spectacular and we’re in the process of getting some gear in for upcoming reviews.